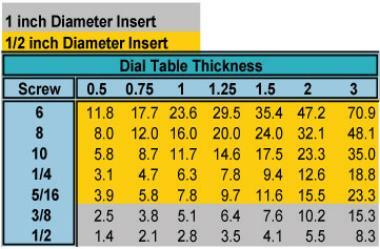 Pull out comparison analysis of inserts compared with aluminum Mic6, aluminum 6061-T6 and A36 steel. Insert pull out was determined using a shear strength allowable of 2,000 psi (Epoxy adhesive). To show comparison, a factor of safety was calculated comparing each material pull out strength with the strength derived for insert pull out. 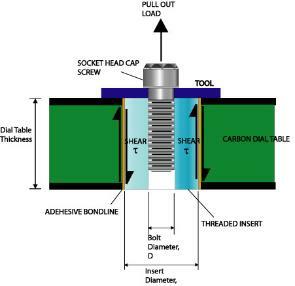 A factor of safety greater than 1 means that the traditional material experienced pull out (thread failure) before the insert. 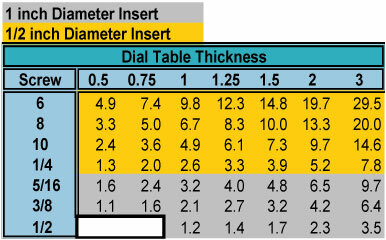 Graphs show pull out performance for 1 inch thick Dial Table. 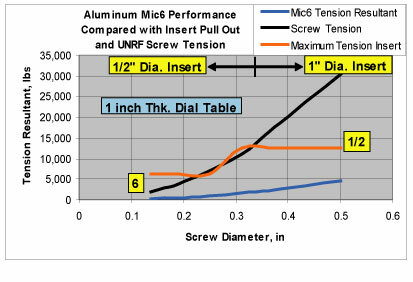 Graph shows screws in Aluminum Mic6 pull out before the insert. Note for small screw sizes the screw may break before insert pull out. 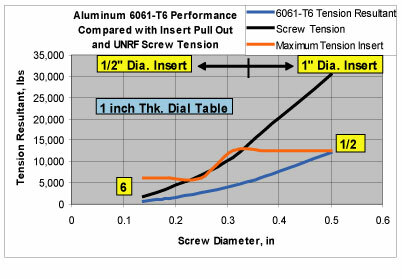 Graph shows screws in Aluminum 6061-T6 pull out before the insert. Note for small screw sizes the screw may break before insert pull out. 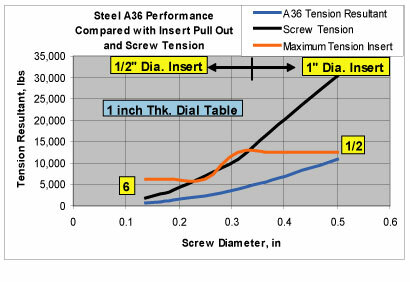 Graph shows screws in A36 steel pull out before the insert. Note for small screw sizes the screw may break before insert pull out.